Three more days!!!! On Friday I'll be running my first ever full marathon. Today I did my last training run, a leisurely 6k around the block. I am getting excited. And nervous! Three more days where I can get run over by a bus, break my legs while running after my kids, catch a cold or stomach bug...... My mind is playing tricks with me. Every little niggle in my limbs is magnified out of all proportion by my brain. Each sniffle feels like full blown flu coming on. If someone told me that the marathon would be tomorrow instead of Friday, I'd be soooo ready. No more running now until the actual race. I have always supported the theory of "less is more" in the last week before a race. Now I have to focus on food. CARBS, CARBS, CARBS is what I need now. Preferably of the lower GI sort. I'll give up my ONE glass of wine per evening for the last 48 hours before the race. And lots of water to be properly hydrated at the starting line. The carb issue turns out to be one of my incognito New Year resolutions: to increase the amount of low GI foods in my diet. Those low GI food will provide a slow but even supply of energy to my muscles during those hours of the run. I have been stuffing myself with oats, beans, lentils, fruits and veggies. In fact, it gives me huge pleasure to create salads out of low GI foods. I have put a lot of quinoa, buckwheat and barley into my salads lately. All these grains have a substantially lower GI than rice (even brown rice), couscous or millet. Combined with any beans, lentils, raw fruit or veggies plus some dried fruit for natural sweetness and a generous sprinkle of toasted nuts and seeds will leave you full and happy for hours. Well, we'll see on Friday if it helped me to finish a marathon. I will let you know. Watch this space. PS: I pondered for some time if I should make it official, and I decided to tell you my goal times: I aim to finish this marathon in 4 hours. With 4h15min I'd still be very happy. And I should definitely be able to run it in 4h30min. Now you know!! Cook barley in three cups of slightly water until tender, about 30 minutes. Rinse and drain. Set aside. In a dry pan, toast sunflowers seeds over medium-low heat for about 3-5 minutes. Set aside. Then toast almonds for about 5-7 minutes. Let cool almonds and roughly chop. Set aside. 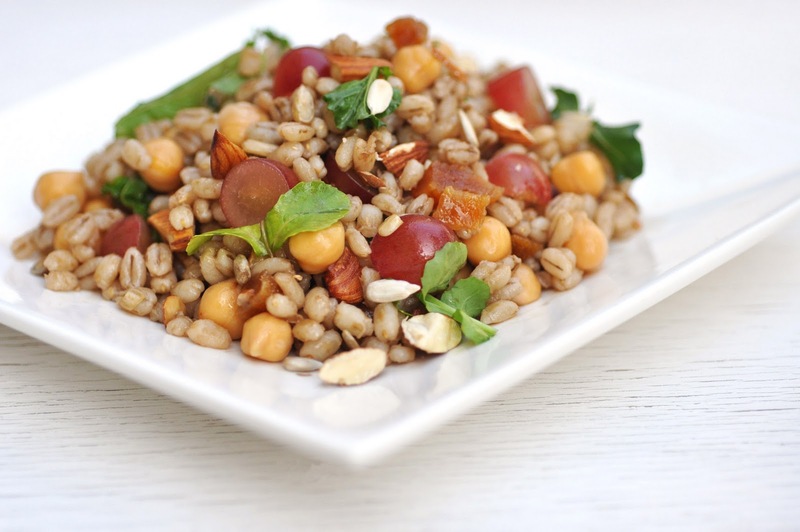 In a serving bowl, combine barley, chickpeas, grapes, apricots, arugula, almonds and sunflower seeds. Mix olive oil with balsamic vinegar and pour over the salad. Stir until evenly coated. Serve immediately or store in airtight container in the fridge for up to 24 hours.